This week Texas weather hit an all-time high of 70 degrees. After going through three weeks of temperatures below 20 degrees, we Texas are breaking out the shorts and flip-flops! Ah, spring is on the horizon! Not really though—I checked the weather just now and in a few days we will be back down to 50 degrees. But who cares! We can stop making the warm soups and begin breaking out the crisp vegetables and fruits. A local grocery store in my area called H-E-B had blackberries on sale for 99 cents a pint a few weeks ago. The berries sat in my refrigerator for a good 2 weeks before I decided what to do with them. Blackberry freezer jam was to be their plight! I had more blackberries in the freezer as well so I got those out and defrosted them in some warm water. I happened to have a case of canning jars and pectin on hand so at midnight (on a school night no less) I made freezer jam. My roommate and I love to bake, and we tend to bake at sinful hours of the night. I have no regrets though, and you won’t either if you make this delectable jam! These make great gifts—it is so simple to tie the jars with string, ribbon, or whatever you have on hand! Label with some tape or if you are a crafter and sale-buyer like me, you probably have some official labels on hand. Canning jars can be found on sale at Hobby Lobby and Michael’s every so often. I never buy anything regular price! Without further adieu, here is the recipe. I made 12 jars of this jam in about 1 hour. Mix in the pectin and sugar until both are well incorporated. 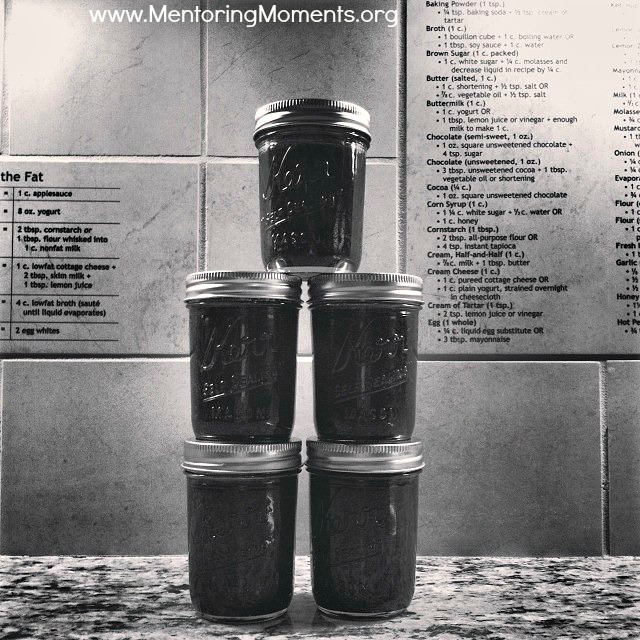 Scoop into the jars, but leave about 1 inch of space at the top of the jar because the jam will expand in the freezer. Let it set for 30 minutes, then put in the fridge or freezer for later. Jam will last 1 month in the refrigerator and up to a year in the freezer. The morning after I made this jam, I baked some berry muffins, boxed them up and included a small dish of the jam in the box. These boxes went to my roommate and beau. The jam received rave reviews! I also gave away a couple jars to close friends on my school campus. If you want to brighten someone’s day and not use a lot of effort to do so, I encourage you to try this recipe.